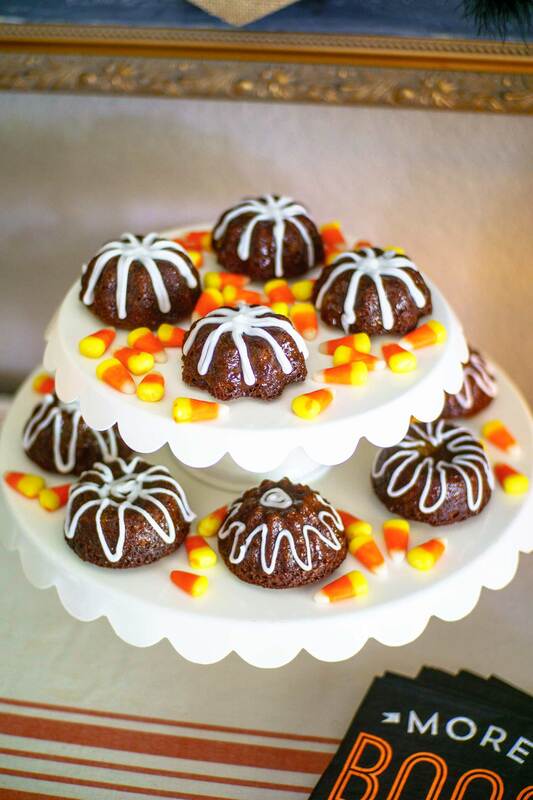 These sweet little gingerbread cakes are adorable and easy to make in a mini bundt pan. Perfect for all year round, these feature an optional peach glaze. I can’t believe how stinkin’ adorable these mini bundt cakes are. My husband is a gingerbread fiend, and although some people save gingerbread for Christmas, I think it belongs among the spices of fall. Since hubs is such a fan, he doesn’t bat an eye when gingerbread starts popping up for dessert. 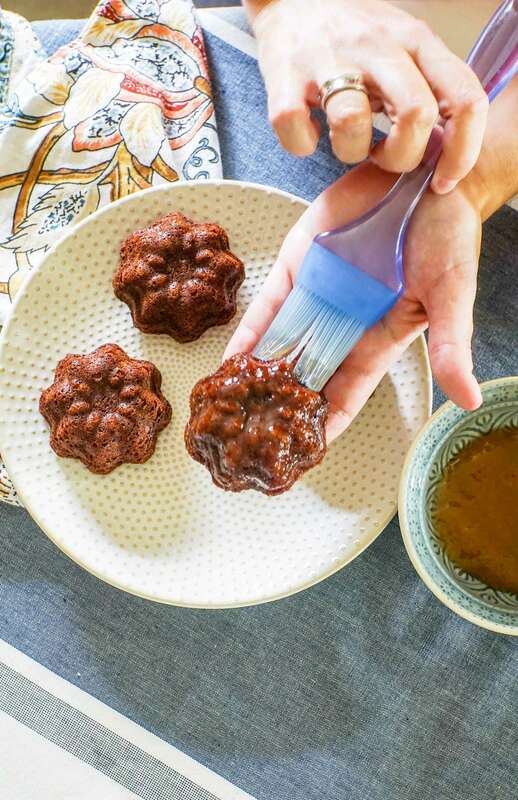 These tiny little cakes are easy to make and feature a peach glaze but you can decide to leave them plain, or change your glaze flavor. They are adorable on a small plate and stunning together on a cake plate. I’ve featured these on classic white cake stands, in my Halloween display. My kiddos adore having holiday decor and they were pleased as punch to see the pumpkins and bats come out to play. I think the chocolate eyeballs were the favorite though. I’m the worst at piping, so ignore my shaky hand with the designs. I promise they still taste fantastic! You can easily just serve the cakes with just the peach glaze or a dusting of confectioners sugar. The trick to these little cakes is a mini bundt pan. This one is my favorite because it makes 12 at a time, with 3 different bundt designs. You need just a few simple ingredients to make these cute little cakes. I love this batter bowl because it has a non-slip bottom! The trick to the airy batter is using a sifter for the dry ingredients. I love this classic style sifter. It makes me smile every time I use it. Just be sure to not overfill the bundt pan or you might have some lopsided cakes. The batter is a light cake batter, not dense at all. Once the cakes are cooled, you can sift some powdered sugar on top, or brush with your favorite glaze. I picked peach to go with the fall harvest. I think they make a fun Halloween dessert. They are not a traditional dessert in the fact they don’t feature candy eyes or Frankenstein faces, but I believe the ginger cakes were popular around the 1940’s. Rather than baking in a simple 9 x 13 the bundt pan adds a bit of character. My Halloween buffet is easy to recreate! Cost Plus World Market is one of my favorite places for Halloween Decor and Halloween Baking! Here I am using my favorite gray candle holders (great any time of the year! ), my favorite drink dispenser, and my go-to cake stands. 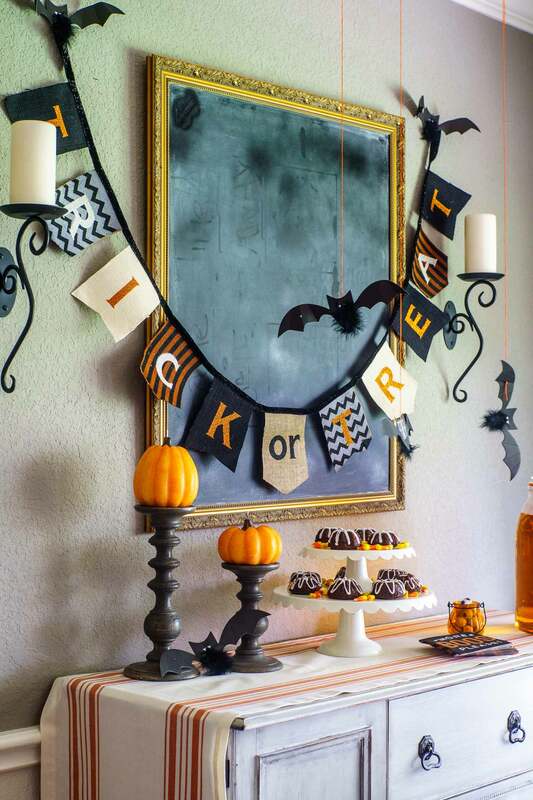 The pumpkin candles, the furry bats and the classic Trick or Treat banner are seasonal touches. The runner is one of my all-time favorites. I don’t think this orange color is available anymore, but I’m totally craving the black one. My local store was sold out, so I can’t wait to pop back in to the College Station store to grab one when they are back in stock. You can find your nearest store HERE. Cost Plus World Market is so excited about Halloween this month that they’re giving away (4) $50 World Market Gift Cards each week!!!!! 1. Share a photo or video on Instagram, Twitter or upload directly here: Halloween Photo Contest. 2. Use #WorldMarketHalloween and #Contest in the caption if you’re submitting on Instagram or Twitter. 3. Cost Plus World Market will choose and announce 4 winners each week. Be sure to check out their weekly Halloween Themes. Be sure to find all the fun items for my post here! Now for the recipe! Enjoy! 1/16 tsp ground cloves seriously, just a tiny pinch. Preheat your oven to 350 degrees. Spray the mini bundt cake pan with non-stick cooking spray. Add in 1/3 of the sifted flour mixture, stirring, then 1/2 of the milk, then another third of the flour mixture, the last of the milk, and finish with the rest of the flour mixture and stir until smooth. Scoop the batter into mini bundts just above the half way mark. Bake in your preheated oven 13-15 minutes. Allow to cool on a cooling rack for 10 mins then invert pan and release the cakes. Once cooled, coat with the peach preserves. Coat it on with a brush. Pipe a simple mixture of confectioners sugar combined with milk onto the cakes and serve!